Ethernet Cable Comb Tidy Tool Quickly Create Perfect Looms Of Cat 3 / Cat5 / Cat 5e / Cat 6 / Cat 6a / Cat7 RJ45. Just place your cables into the slots on the inner part of the tool, then using the outer ring just lock it place over the inner comb tool, slide the tool along the bundle to keep your cables straight binding your cables together as you progress down the cable run. Crimping Cutter Tool With Stripper. Suited for network cable with RJ45 CAT5, CAT6 & CAT7 Connector and ADSL Cable with RJ11 Connector. RJ45 Multi- Purpose Punch Down Tool. 1 x Crimping Cutter Tool With Stripper. Suited for network cable with RJ45 Connector and ADSL Cable with RJ11 Connector. 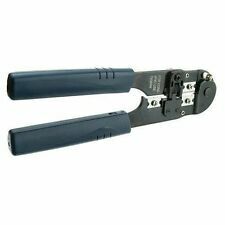 RJ45 Crimping Tool Cable Cutter. 1 x RJ45 Crimping Tool. Standard Cat5e RJ45 network cable connector. RJ45 Connectors. JST Crimp Series … bd bh bhm bhs bht bl cz czw eh el gh hl hm jfa jwpf krw lc lv mwp nhy nv nva otz pa pad pal ph phd pn pnd pni pud ra rcy re riz rwz san sbn scn sh shd shl shld sl sm sv szn va vb vh vl vu vyh xa xad xh xl xm xma yl ylh yln ze zh zl zm. 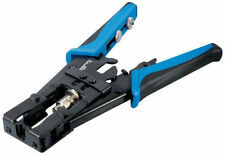 RJ45 Crimping Tool Cable Cutter. 1 x RJ45 Crimping Tool. Standard Cat5e RJ45 network cable connector. Suited for network cable with RJ45 Connector and ADSL Cable with RJ11 Connector. RJ45 Connectors. Suited for network cable with RJ45 CAT5, CAT6 & CAT7 Connector and ADSL Cable with RJ11 Connector. Standard Cat5, Cat5E, Cat6 & Cat7 RJ45 network cable connector. 10x RJ45 Cat5, Cat5E, Cat6 & Cat7 Modular Plug Network Connector. Crimping Cutter Tool With Stripper. 1 x Crimping Cutter Tool With Stripper. RJ45 RJ11 Network Cable Tester. RJ45 Multi- Purpose Punch Down Tool. 1 x RJ45 Multi- Purpose Punch Down Tool. Suited for network cable with RJ45 CAT5, CAT6 & CAT7 Connector and ADSL Cable with RJ11 Connector. Your network crimp will be easily verified that you have the wiring in the proper order before finishing the crimp. Line your colours up before pushing the wires through the connector and out the front, then simply crimp the cable! Standard Cat5e RJ45 network cable connector. 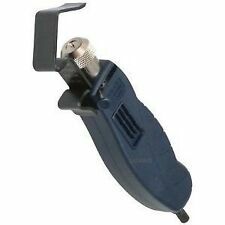 RJ45 Crimping Tool Cable Cutter. Snagless boot/s for CAT5 / CAT5E / CAT6 Networking Cable. RJ45 Connectors Compatible to standard RJ45 sockets. RJ45 Boots. 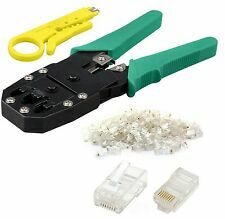 Crimping Cutter Tool With Stripper RJ45 Multi- Purpose Punch Down Tool Suited for network cable with RJ45 CAT5, CAT6 & CAT7 Connector and ADSL Cable with RJ11 Connector. 1 x Crimping Cutter Tool With Stripper. Includes tool ends for cutting, stripping and inserting. Can be used for both UTP and FTP cables. The mouth of the press-pliers is made of magnetic steel, which is hard and durable. While using press-pliers, just insert the crystal top into its position and press it. Crimping Cutter Tool With Stripper. RJ45 Multi- Purpose Punch Down Tool. Suited for network cable with RJ45 CAT5, CAT6 & CAT7 Connector and ADSL Cable with RJ11 Connector. RJ45 RJ11 Network Cable Tester. Crimp Tool. Professional Fiber Optic Tool Kit. Kevlar Cutter. Wiper Paper. Glass Working Pad. Crimper Tool for Crimping RJ45 Modular Ends. This item is a Modular Plug, Crimp, Strip & Cutting tool. Make your own Cat5, Cat5e, Cat6, RJ45 cables or adapt existing cables. Cutting Tool. 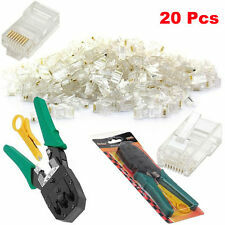 RJ45 Ethernet Network Lan Cable Tester Crimping Crimper Stripper Cutter Tool Kit ! Crimping Cutter Tool With Stripper. 1 x Crimping Cutter Tool With Stripper. Suited for network cable with RJ45 CAT5, CAT6 & CAT7 Connector and ADSL Cable with RJ11 Connector. 305M CCTV,DVR Shotgun Power Cable Network Kit. CCTV Camra / DVR Systems. This cable combines an RG59 video signal cable with a DC cable. RG59 2CORE. Automatic scan for the wrong wiring or disorder cable. 1189 • 1190 • 1380 • 1381 • molex kk • molex micro-fit • molex mini-fit • molex mini-latch • molex mini-lock • molex mini-spox • molex spox. 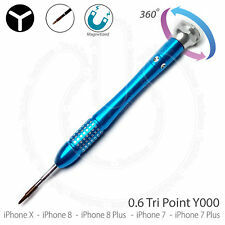 also capable of crimping open barrel pins with longer style lugs (yields an excellent 'pin curling' result). Network LAN Cable Tester RJ45 RJ11 RJ12 Cat5 Crimper. LAN Cable Crimper Cable Tester 100 RJ45 Modular Plugs Toolkit for Network Professionals. Cable Crimper Suitable for Cat5, Cat5e, and Cat 6 cable with 8P8C plugs. 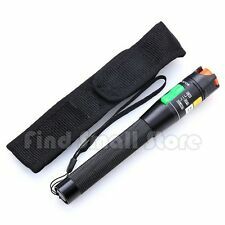 1 x Ethernet Phone Cable Multi Punch Down Tool. The mouth of the press-pliers is made of magnetic steel, which is hard and durable. While using press-pliers, just insert the crystal top into its position and press it. 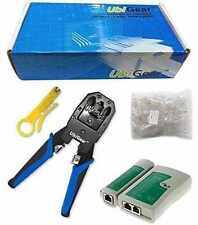 EZ RJ45 EZ-RJ45 PRO HD CRIMP TOOL & WIRE STRIPPER INCLUDING FREE HARD CASE! 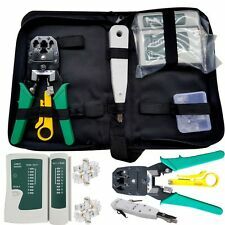 NEW EZ RJ45 EZ-RJ45 PRO HD CRIMP TOOL & WIRE STRIPPER FOR EZ RJ45 CONNECTORS. This is a very heavy duty tool and is the perfect solution when working with the EZ-RJ45 CAT5e & CAT6e connectors. - One action to crimp and trim. EZ RJ45 EZ-RJ45 PRO HD CRIMP TOOL & WIRE STRIPPER FOR EZ RJ45 CONNECTORS WITH 100 CONNECTION ENDS. 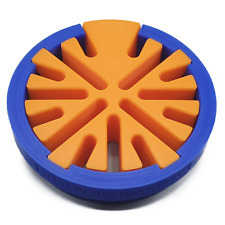 This is a very heavy duty tool and is the perfect solution when working with the EZ-RJ45 CAT5e & CAT6e connectors. Professional Ratchet Action Modular Crimp Tool. 9.5” Ratchet Action Crimp Tool for Modular Plugs. (RJ45, RJ12, RJ11, RJ22). Ratchet design makes it easier to operate. Multifunctional tool will strip and cut network wire as well. Crimp Steel Wire Rope Ferrules and Wire Rope Stop End From sizes 1mm-3mm. STEEL WIRE ROPE, FERRULES, THIMBLES AND FIXINGS. Realise and understand the risks before undertaking any repair. Your health and safety is paramount. The built-in wire cutter and stripper for silver satin cable help to reduce the amount of tools needed on the job. This is a very heavy duty tool and is the perfect solution when working with the EZ-RJ45 CAT5e & CAT6e connectors. EZ RJ45 Crimp Tool 100004C for EZ RJ45 Cat5e and EZ RJ45 Cat6 Connectors. The straight action ensures a uniform, accurate crimp every cycle. Ratcheted straight action crimp ensures a uniform crimp every cycle. RJ45 and RJ11 Crimping Cutter Tool With Stripper. Crimping Tool Network Cable Tester. This RJ45 Crimp Tool makes it easier to trim patch cords into any lengths you need. Now you can crimp, cut, and strip with one convenient tool. This crimping tools allows a future upgrade path - for example, initially you might only have a need to crimp very small crimp pins - but at a later date you are faced with crimping larger crimp pins. simple - just buy & fit the larger die plate! The Engineer pad-02crimping tool kit is an ultra precise crimping tool where the precision dies can be easily changed - this provides you with the capability to crimp a multitude of different sized crimp pin types from the likes of Molex, JST, Tyco, JAE, Amp etc. Cable Stripper. (30) RJ45 8P8C Crimp-On Plugs. Cable Cutter. Punch Down Tool. Professional Networking Tool Kit. 1 x Cable Crimper (for 8P8C RJ45 and 6P4C RJ11). 100 Pieces CAT5 Connector. 1 x Network Cable Tester. · Ratchet safety-release and a blade-guard on cutting and stripping knives reduce the risk of injury. A great addition to any surface mounting application. 1 x Fusion RED IDC Krone Style Punch Down Tool. 1 x Fusion CAT6 IDC Coupler Joiner. 1 x Kauden Cable stripper. 10 x RJ45 Boot Covers. 10 x RJ45 Cat5e Connector Plugs. 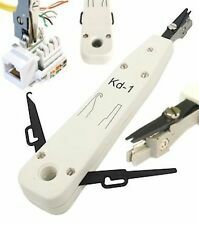 1 x Kauden RJ45 Plug Crimping Tool with. Lindy Universal & LAN Tool Kit 54 Pieces. Designed for network technicians and installers, this high quality 54 piece tool kit features a LAN cable tester plus an excellent selection of essential tools. Can be used with our Cat 5e, Cat 6, Cat 6A unshielded keystone jacks. Keystone Socket: PC 10% GF. Punch down and trim all 4 pairs at once. Cell Phones & Accessories. Carbon steel body. All Products. Alloyed steel blades. Cable Type: CAT6 FTP (Foiled Twisted Pair Cable). This Network CAT6 RJ45 Ethernet LAN Cable is made using premium materials to enhance performance standards for twisted pair cable systems. Suited for network cable with RJ45 CAT5, CAT6 & CAT7 Connector and ADSL Cable with RJ11 Connector. Compression Connector Crimper Tool. 20 x RG59 BNC connectors. Waterproof Connectors Crimping tool. Dual blade system. Coaxial Cable Rotary Stripping Tool. Carbon Steel Construction with Black Oxide Finish. Trim the wires and crimp the connector in one step with the EZ-RJ45 Crimp Tool. - 100 units of Ez connectors. We will always go out of our way to source the product you are looking for. Work with solid or stranded cable (24 AWG maximum). UbiGear Cable Tester Crimp Crimper 100 RJ45 CAT5 CAT5e Connector Plug Network Tool Kits (PremiumTester). Cable Crimper 1 x 568R Crimper -- works for RJ11 (6P4C), RJ12 (6P6C) and RJ45 (8P8C) connectors. This is simply a all in one impact bix / IBDN tool. IF you want just the bix bit for your twist lock punch tool. I need to be right with getting my product to you. My theory is if you are right with your money. Fusion IDC Professional Tool. It can be used for voice, video, audio, security and many other applications. Suitable for Audio, fibre optic and data cables. Long blade life. Professional tool. 1 x Life Warranty Mills Scotchlok Jelly Crimping Tool 8a 8b. Mills 8a and 8b Jelly Scotchlok crimper. 1 x Cable Stripper with IDC Inserter Tool. 1 x IDC Punch Down Tool for BT Sockes and Data Modules. Cable Type: CAT6 FTP (Foiled Twisted Pair Cable). Compliance Standards: Compatible with CAT5 / 5E / CAT6, EIA/TIA-568 Category 6. Suited for network cable with RJ45 CAT5, CAT6 & CAT7 Connector and ADSL Cable with RJ11 Connector.